Amazon’s kindle is a boon to women like me. Books galore and priced attractively they are a Pandora’s box. As I was scrolling through the sections, one book caught my eye. In fact it was the title that I was attracted to. 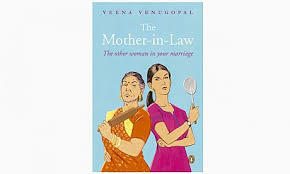 The mother in law- The other woman in your marriage by Veena Venugopal is a witty yet, grim book about the apathy of daughter-in laws in this country. Beginning with the authors own personal experience of her mother in law, it takes us through the lives of various young women, dealing with some really difficult mom-in laws. Be it Rachna, Keisha or Carla, the tales are saddening and gets you thinking at what exactly our whole social system has developed into. Heart wrenching at times, the book sure does make a good read. What gives the book a thumbs up is the fact that it brings out a multitude of issues that could croup up between the two-Daughter-in-law & Mom-in-law. The language is maintained simple, impeccable english writing skills I must say, though a bit draggy in the second half of the book. She doesn’t really arrive at major conclusions except with some simple commandments for daughter in laws. This is surely a book I would recommend to every daughter in law. My rating would be 4 out of 5. Publish date May 2014 and the book is available on Flipkart and Amazon online. "As long as there is no physical abuse in the marriage, it could be endured".